Taking the paths you choose, learning to work with the car as a family, and discovering the Southwest off-road in the 1950s before people really did that. That’s what makes this Willys Jeep CJ so special to Larry Shank. 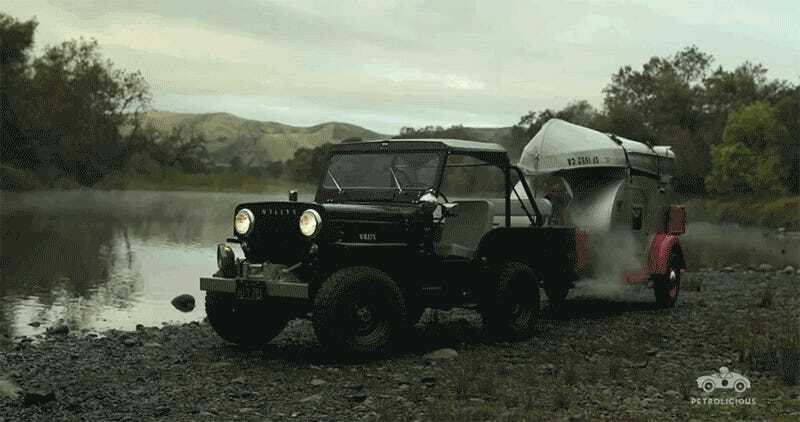 Shank’s father worked on radars and jets at Lockheed after the war, and to get away from it all, he bought a 1953 Willys CJ-3B, attaching a 1947 Ken Skill Teardrop Trailer Model 10 behind it so that the whole family can go on an adventure that started straight off their driveway every time. Back when it was new, his dad kept upgrading the car throughout the years, adding a V8 in 1955, a new gearbox with overdrive and all the gauges he could fit on the dashboard. Setting up camp in the most remote areas, thinking about the big questions in life and pretending to be lost just for the fun of it. Driving all across the Southwest before it was cool made Larry grow up in the car, learning how to drive and work on it before he could finally put it on his name. He’s been driving it ever since. As Petrolicious’s great film explains, this Jeep has seen all that was worth seeing, and is not done just yet.